Stanbic Bank Tanzania has selected two beneficiaries for its regional graduate development program that will offer on-the-job experience, inclusive of a year’s training on data science and analytics. The beneficiaries of the Stanbic graduate scheme program in Tanzania are Edwin Kajuna 25, and Sarah Mwamlima 24. The two will join eleven other top graduates from Nigeria, Mozambique, Swaziland, Uganda and Zambia at a Standard Bank Group Graduate Development Centre in South Africa to fast track their careers. On his part Kajuna, who graduated at the top of his class with a Bachelor of Science degree in Information Technology and Systems, the analytical knowledge will go a long way towards building his capacity to produce useful information that will aid decision making in business organizations. Kajuna and Mwamlima applied for the scholarship after Stanbic bank issued a public notice through universities in Tanzania, encouraging fresh graduates to apply. The bank also circulated an internal communication encouraging staff to apply who meet the academic requirements and have been with the bank for more than one year. “The two candidates stood out as top performers in a rigorous selection process that started with over 200 applicants,” said Eutropia Vegula, Head of Human Capital at Stanbic Bank Tanzania. The program will kick off with a Data Science Conference and business orientation training in South Africa. From there, the beneficiaries will proceed to India for another three months, where they will participate in a Data Science International Bootcamp that will expose them to classroom training in advanced data analytics. The trainees will also undergo a series of training in technical business skills and intense three months of practical project implementation. Each module of the program is supported by classroom training, mentoring and a short-term practical assignment to give the trainees a new learning experience to develop their skills and abilities. The program will enable the bank to leverage on data to make sound business decisions and translate into tangible business value and enhance their customers’ experience. “Data is only valuable if you can translate it into actionable business insights. This has prompted us to introduce this accelerated graduate program that we believe will ensure Tanzanians can participate fully in the development of the banking sector as well as take advantage of the opportunities it will create in other sectors of the economy”, said Vegula. She affirms that when big data is effectively and efficiently captured, processed, and analysed, the bank will be in a position to gain a more complete understanding of its customers, leading to efficiency improvements, better customer service and tailored products to meet customer needs. The Stanbic graduate scheme program is currently being implemented across the Standard Bank Group, and encourages high level growth with professional qualifications and training critical to a career in banking. The program identifies and nurtures talented graduates around the continent to lead the banking industry in the future. “We are delighted to have program participants from Tanzania and this speaks volumes of our commitment to advancing the capabilities of future Tanzanian business leaders, leveraging the global expertise of the Standard Bank Group. This is an exciting time for Tanzanian graduates and a step forward in our journey to maintain our position as the leading bank in the nation and the continent”, Vegula shared. She also revealed that later this year, Stanbic Bank Tanzania will launch an in-country comprehensive graduate program which will see six young Tanzanians being recruited to join the ever-expanding Stanbic Bank team. 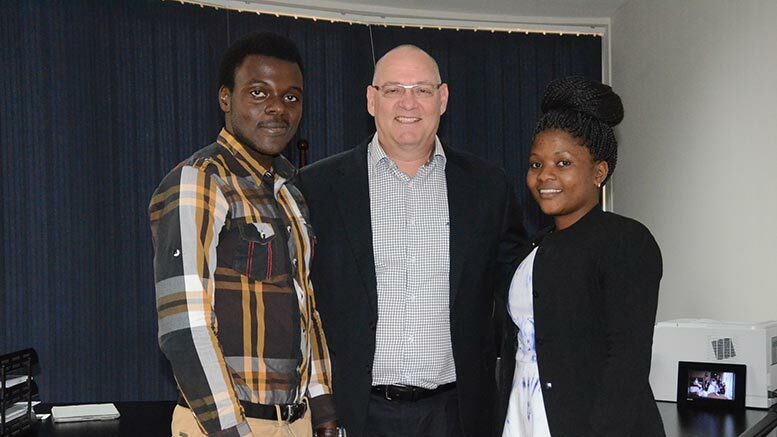 Before their departure over the weekend, the two graduates paid a courtesy visit to the bank’s head office where they met with the Chief Executive Officer of Stanbic Bank Tanzania, Ken Cockerill.